Turns a cold water pressure washer into a hot water unit. Shark series water heater provides supplimental heat to cold water machines giving users the benefits of hot water cleaning when its needed. 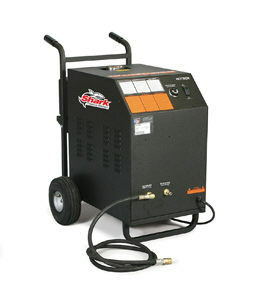 An electric powered diesel heated unit effectivly heats water at a rate up to 5 galllons per minute up to 3000 psi. * Please call us for any questions on our pressure washer hot water hp heater rentals in Portland OR, Gresham OR, Milwaukee OR, and surrounding metro area.